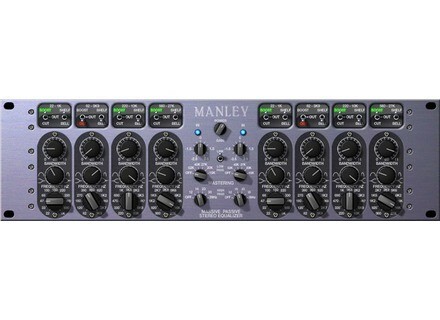 Manley Labs Massive Passive EQ, Software parametric EQ from Universal Audio in the UAD Plug-In series. loudfunk's review"a wonderful unusual EQ..."
Universal Audio’s standard and mastering versions of the Massive Passive EQ plug-in are included. 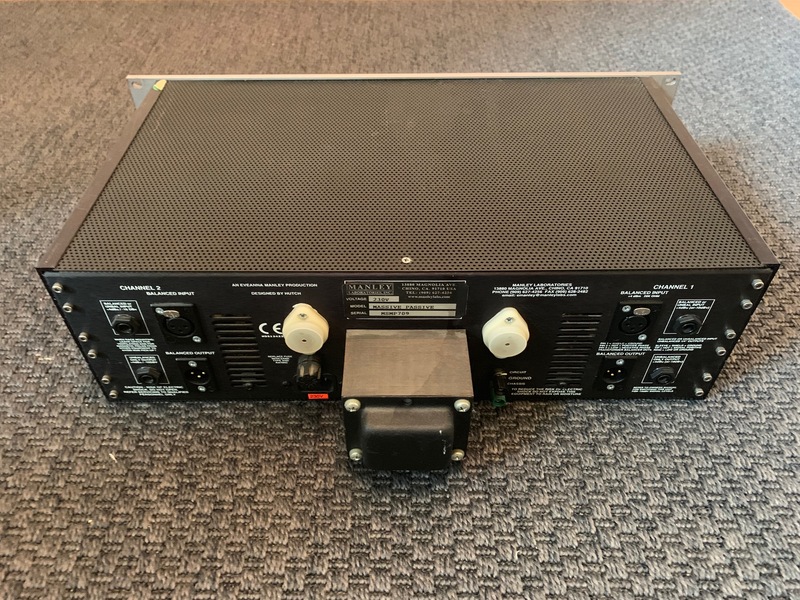 Both cap- ture the behavior of the original hardware; from the unusual filter curves, to the multiple band interdependencies, right down to the tube amplifier distor- tion, and all-important transformer/inductor hysteresis. “Passive” refers specifically to the tone shaping elements of the equalizer, which use only resistors, inductors, and capacitors to create all frequency changes. The Massive Passive utilizes older parallel concepts rather than non-interactive series designs as defined by George Massenburg’s original parametric EQ. The Frequency controls intentionally interact with one an- other, as do the Gain and Bandwidth controls. While this may result in the ap- pearance of some unorthodox knob positions, it is specifically these band in- terdependencies between all bell, shelf and cut filters that allow for the Massive Passive’s natural and organic sound. The Massive Passive has design and operation characteristics that make it unique in the EQ world. Some of these factors mean the “Massivo” may not respond in a manner that you would expect from typical EQs. Keeping these points in mind may help you obtain more satisfactory results. 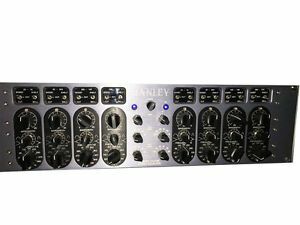 No active components are used in the EQ circuits, just like revered vintage EQs. This can make some adjustments respond in more subtle ways. The EQ bands are routed in parallel instead of serially, so gain values for the bands don’t “add up” like most EQs. For example, if two bands in the same channel are boosted 20 dB at 2.7kHz, you’ll get much less than 40 dB of boost at 2.7kHz. Most EQs offer a shelving mode for the edge bands only. Massive Passive of- fers the shelving option on all bands for expanded sonic possibilities, such as “staircase” EQ curves. One result of not using negative feedback loops in the design is that the gain control for a band cannot have a “bipolar” boost and cut control. Only band gain is available; how that band gain is applied, either as a boost or as a cut, is specified with a separate toggle switch. Due in large part to the above points, the Massive Passive controls are much more interactive with, and interdependent upon, each other. We encourage experimentation with an open mind, without expectations of what a visual in- terpretation of what control settings “should” do. Nothing to be done as usual with UA. 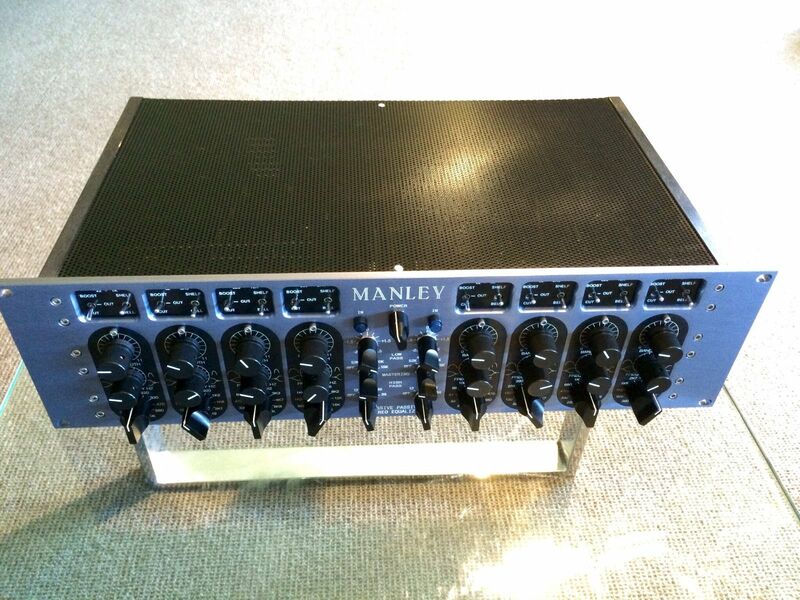 The emulation of the Passive Manley is perfect. Differentiate the original plugin is almost mission impossible. It is expensive for the plug but given the little difference with the hardware version, you say that in the end it's not that expensive considering the quality. One con, it is using a lot of resources on the soundcard. I have many other plug-ins for the UAD are "pickpocket" virtual: When trying a plug, it is found useful and say I need it. I like this plug has a real personality, when it is running on a track can be heard. presets are very useful bass drum .... it sounds full, almost analog ..... and especially music. If you are looking for transparency, this plug is not for you! (Note: if it is transparent there would be nothing . there is also a version with presets for mastering, génialissisme! quite resource intensive but the important thing is efficiency. it's still expensive but the UAD plugs I do not regret this purchase because the result is still there. A ----- When a plug-in version of the Variable-Mu compreseur Sirs AU home? 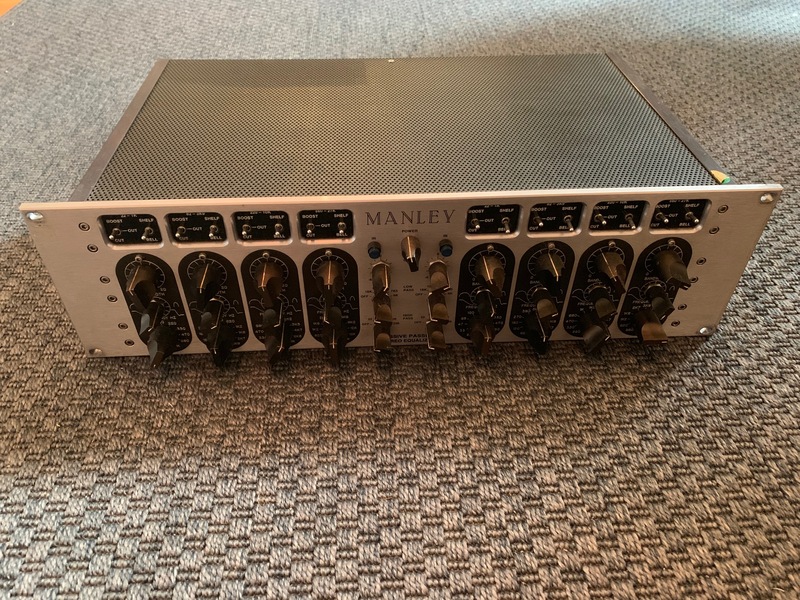 Universal Audios UAD Powered Plug-In versions of the Manley Massive Passive EQs represent UAs most ambitious and detailed EQ model to date, the company says.